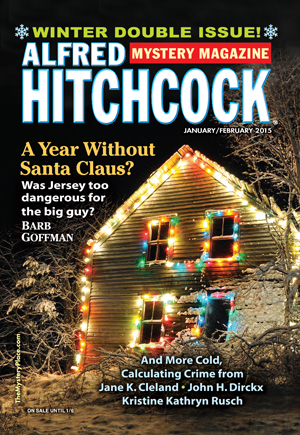 "Christmas Eve at the Exit," by Kristine Kathryn Rusch, in Ellery Queen's Mystery Magazine, January 2015. This is Rusch's fifth appearance on my best-of-the-week list, which I believe puts her in a tie for first place with Brendon Dubois. It is Christmas eve and Rachel and her little girl are on the run. Many pages will pass before we find out from who, and about the shadowy support system that is helping them. Rachel is terrified, not sure who to trust, and desperately trying to keep up an appearance of normality for her daughter who, heartbreakingly, seems mostly concerned about Santa Claus. And that's enough from me. Rusch carries the story off with great audacity. I am sure it will appear in holiday-themed anthologies for years to come. 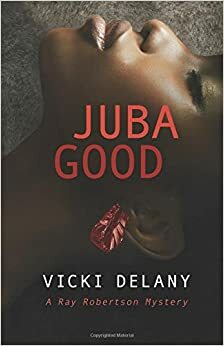 "Juba Good" by Vicki Delany, Rapid Reads, Orca Book Publishing, 2014. A terrific novella about the thankless task of policing in one of the world's newest nations, South Sudan. Ray Robertson is a Canadian cop finishing a year as an advisor to the new police force of the city of Juba. His routine is shattered by the serial killings of several prostitutes. Ray is a patrol sergeant with no experience as a detective, but he is the best they have. Complicating matters: such modern techniques as DNA analysis are beyond the local labs, so if the bad guy is going to be caught it's going to take interrogations, fingertip searches of crime scenes, and plain old cop-thinking. "The Crossing," by Brendan DuBois, in Alfred Hitchcock's Mystery Magazine, January-February, 2015. So a trio of mobsters decide to slip out of the country a few hours ahead of an indictment. A seaplane lands them on an island on a lake by the Canadian border. Now they just have to wait for their friend to arrive with a boat to slip them across. Sure, there is a resident on the island, but she's just a beautiful young woman, grading papers. Surely she can't cause any trouble for three armed hoodlums. This is Mr. DuBois's fifth appearance in my best-of-the-week column. I guess I like his stuff. "The Really Big Ka-Boom," by Kristine Kathryn Rusch, in Alfred Hitchcock's Mystery Magazine, January/February, 2015. Apologies for misspelling Ms. Rusch's name, now fixed. I may have to revise my rule about what makes a story one of my favorites. I have said they tend to have at least one of three characteristics: a great concept, a twist ending, or heightened language. Ms. Rusch has reminded me of a fourth method to reach the winner's circle. The narrator is Spade, a three-hundred-fifty pound retired software millionaire whose life revolves around science fiction conventions, for which he provides accounting skills. His soulmate (he wishes) is Paladin, a young private eye who is everything he isn't (except dumb and socially competent): she is small, beautiful, perpetually angry, and rash. Clearly they balance each other out. In this story they wind up in Portland, Oregon at Christmas time, accompanied by Caspar, a homeless thirteen-year-old computer whiz they rescued in an earlier adventure. The main story begins when they go out to eat and a nearby building explodes. And Paladin, as Spade notes, is the sort of person who rushes into a burning building. Paramedics had moved a lot of the people Paladin saved, sorting them as if they were damaged collectibles and someone had to grade them: Fair, Very Fair, Good. The folks in Mint condition stood to one side, and those who were judged Poor had already been stuffed into ambulances and driven to hospitals.